It seemed only right that Sussex’s county championship season ended with another draw. That’s how ten of their 16 four-day matches finished, a record that meant they were never in much danger of finishing top of bottom of Specsavers division two. In truth their third-place finish was better than looked likely for much of the summer and there are positives as well as negatives as the county look back on a long, hard season. 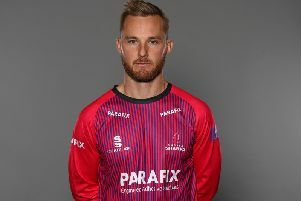 On the season’s final day, Hamish Marshall played his part in guiding Gloucestershire to an unlikely draw against Sussex at the Brightside Ground, Bristol. The draw meant Sussex did not lose any of their eight away championship games. Sussex coach Mark Davis said: “The wicket got slower and lower and it was pretty hard to get wickets. I think it was the wicket that beat us in the end. “Yes, we could have bowled better and yes, we dropped a couple of catches. But the wicket was tough. “We needed to get 20 wickets to win the game and we have come up three short. That’s cricket. “But I am pleased with the way we have played here and pleased with the way we have played for much of the season. Playing his last game for the county, after ten years’ service, 37-year-old New Zealander Marshall struck 77 between mid morning and mid afternoon to lay the foundations for a decent day’s batting from the host county. In the end, his 135-run partnership for the sixth wicket with wicket keeper Phil Mustard was the difference between losing and ending the campaign with a share of the spoils. Resuming on their overnight total of 88 for 3, Gloucestershire still required another 119 second innings runs to make Sussex bat again. When they lost night-watchman Josh Shaw and opener Chris Dent (55) inside the opening 15 minutes of the final day, a heavy defeat looked the most likely conclusion to a game dominated by the visitors. Slow left armer Danny Briggs took both wickets at 92 for 4 and 99 for 5. The departure of Dent, who had passed 50 off 112 balls with five fours, seemed to turn the game on its head. Marshall, determined to go out with a bang, and Mustard, whose loan from Durham was to finish in style, batted with patience and panache as Sussex struggled on a wicket that was, once again, starting to flatten out. Marshall reached his half century off 62 balls, with five fours and a six, with Mustard providing solid support. Eventually, the Kiwi played one shot too many and became Briggs’ third victim of the day, caught by Chris Nash for 77 off 97 balls with one six and nine fours. Mustard continued where his partner left off and with all-rounder Jack Taylor, added a valuable 53 for the seventh wicket. Taylor, who was dropped by Jofra Archer on 14, off the bowling of Steve Magoffin, went on to make 33 before holing out to Tom Haines off a mightily relieved Archer. Mustard kept his calm at the opposite end and Sussex continued to hit a brick wall. The experienced left hander pushed and poked his way closer to three figures, with Craig Miles, at the opposite end, providing adequate support. In the end, the two sides shook hands at 4.20 with Gloucestershire, on 337 for 7, having successfully thwarted the visitors. Mustard ended the day unbeaten on 89 with Miles 16 not out. Together the pair added an unbeaten 50 for the eighth wicket and that was good enough. So Sussex ended with four wins, two defeats and those ten draws - and a total of 192 points. Essex took the only promotion spot in division two.